Gabriel’s Angels Spreading Joy One Paw At A Time | The Pinnacle P.O.V. Recently Pinnacle Education teamed up with Gabriel’s Angels to bring smiles to the students at Pinnacle. 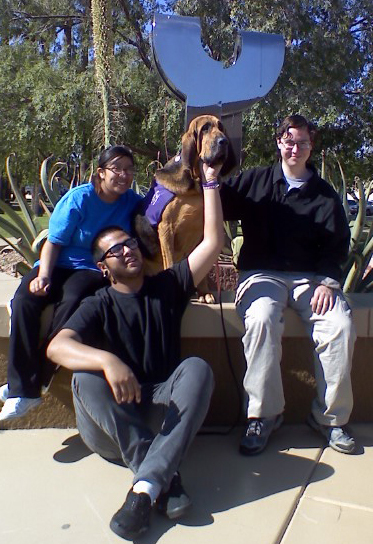 Gabriel’s Angels is a non-profit organization providing pet therapy to over a hundred facilities throughout Phoenix and Tucson, and currently visits with students at Pinnacle Charter High School in Mesa, AZ. The Therapy Team schedules bi-weekly visits, in the presence of a staff member, and provides various activities that encourage the students to interact with and enjoy the therapy dog. The students at Pinnacle anxiously look forward to visits from Beauregard and volunteer Debbie. Check out this great video on the Gabriel’s Angels program and see what a difference it is making in the lives of others, just like our Pinnacle students. ~ by azmegan on April 12, 2010.